Don't forget to bring 'The Little Mermaid' soundtrack on your vacay! Grab your bathing suit, snorkeling gear, and The Little Mermaid soundtrack and head over to The Manta Resort! It’s on the beautiful Pemba Island (or “Green Island”) in East Africa, and it is TDF. If you’re looking to take a break from the chaos of city life, you’re in luck, because it’s as far away from civilization as you can imagine. No distractions! 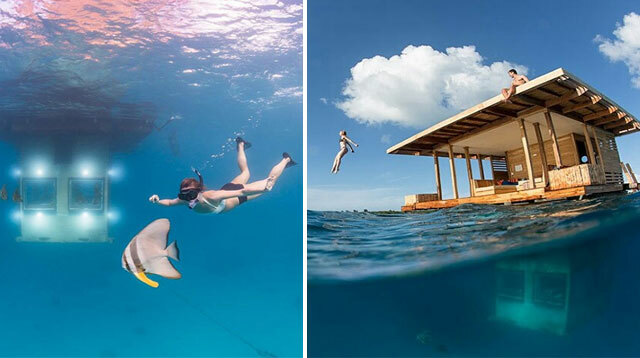 Situated 250 meters from the shore, The Manta Resort’s Underwater Room allows you to sleep with the fishes and admire the beauty of life beneath the Indian Ocean. It’s complete with a landing deck, eco-friendly bathroom facility, cozy double bed, and a lounge area on the roof.